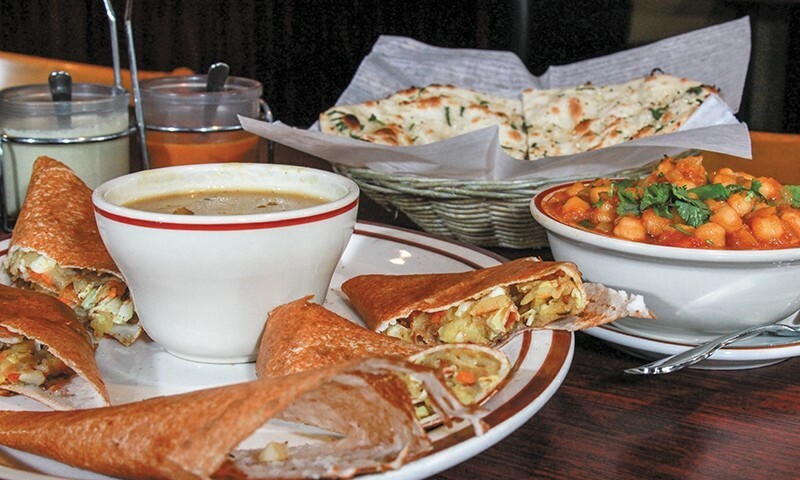 Tucked away in a nondescript strip mall in Midvale, serving authentic dishes from North and South India, Ganesh Indian Cuisine is a gem to discover. The staff takes great pride in their food and restaurant. Bright, clean and modestly decorated with saffron yellow walls, Ganesh is inviting and comfortable. I haven’t visited the American Fork location yet, but I have a hunch that, like the Midvale location, they are one of the better restaurants in the area. 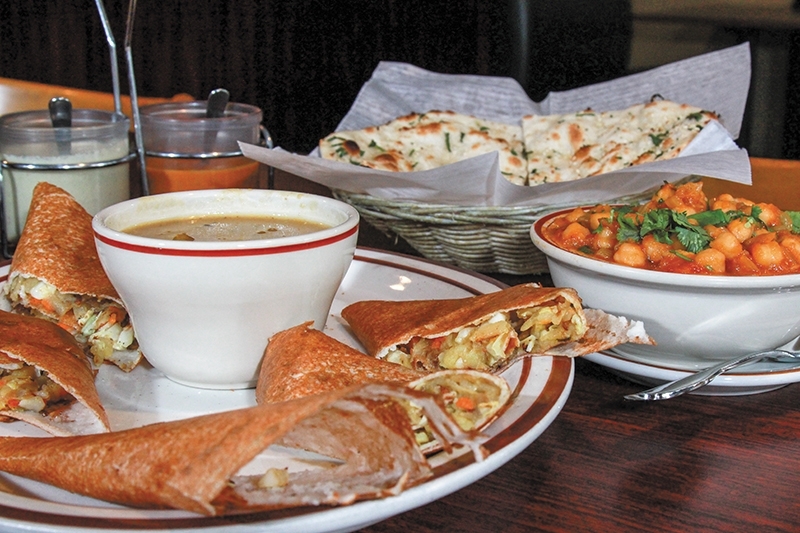 Plentiful vegetarian options are expected in Indian restaurants, and Ganesh doesn’t disappoint. Vegan and vegetarian options are clearly marked on the menu, and there are many to choose from. On the other end of the spectrum, there are plenty of intriguing dishes for omnivores like Goat Curry ($13.99) or Butter Chicken ($11.99). There are also plenty of gluten-free dishes. I’ll admit, I’m crazy for dosa—it’s one of my favorite foods. Dosa is a fermented crepe made from lentil and rice, served with Sambar—a spicy, rich soup with lentils and veggies—and assorted chutneys for dipping. The combination makes for a comforting and filling meal. A server bringing me a large cone of dosa is a fantastic sight, and I don’t think there’s a more impressive dish. It’s also really fun to tear off bits of dosa and dip them into sweet coconut curry or soup—I like to think of it as Indian grilled cheese and tomato soup. There are different ways to order dosa—seven, to be exact. Dosa can be served plain, or stuffed with a variety of goodies like onions or potatoes. The Himalayan Spring Dosa ($7.99), stuffed with cabbage, onion, carrot and potato masala tastes like the best possible version of fluffy, spicy mashed potatoes. It’s also perfect to split as an appetizer. Channa Masala ($10.99) is another favorite and one of my usual orders. There’s something gratifying about the flavors and texture of this dish. Garam masala adds heat and spice while the cinnamon and clove smell heavenly—Indian food has a wonderful way of enticing all the senses! The onions and tomatoes mixed with tender garbanzo beans create a succulent flavor, and the spices elevate the dish to something special. Channa Masala is serious comfort food. It also goes extremely well with Naan ($1.99), a buttery flatbread baked in a tandoor clay oven, or even Vegetable Samosa ($4.99)—bundles of mashed potato and peas, breaded and deep-fried. For dessert, the Kheer ($2.99) is impressive. Kheer looks like warm, melted icing with little bits of noodles. At first, I was suspicious, but when my server flat-out insists I try something, I’m sure to listen. Made with vermicelli, rice and tapioca, and served warm, Kheer is a rice pudding that is more like a sweet, thick rice soup. It’s sweet but not too sweet. Seasonings such as cardamom and saffron are compelling in dessert, adding a unique taste that reminds me of flowers and incense. It’s a wonderful way to end an Indian meal. Ganesh also has fun drinks to enjoy: Mango Juice ($2.99) is sweet and refreshing, and the Mango Lassi ($3.99), a shake made with yogurt and fruit, is always delightful. The yogurt adds a sour tang to the ultra-sweet mango—a lovely combination of flavors. If you’re new to Indian food, the lunch buffet is the ideal way to become acquainted with this cuisine, and it’s great if you’re a bottomless pit when it comes to Indian food—there is a multitude of dishes, appetizers, sauces and desserts to try. Most items offered are vegetarian with the exception of Chicken Tandoori and Chicken Curry. For only $11.99 per plate, I challenge anyone to find a better deal in the valley. I was impressed with everything that landed on my plate—right away, I dug into the freshly fried veggie and eggplant pakora. The rest of my first plate was dedicated to appetizer-type delicacies that I’ve never seen offered at an Indian food buffet. I found large slices of dosa with traditional accompaniments like sambar. I could have made a filling meal with just these two, but there were many other things to try. I was particularly fond of the Malai Kofta, a combination of homemade cheese and vegetable balls cooked in a creamy sauce with cashews. The dish was a few notches spicier than others I’ve tried. Next time I go, I’ll be ordering this off the à la carte menu. TUE – FRI 11 a.m. – 2:30 p.m. / 5 p.m. – 10 p.m. SAT – SUN 11 a.m. – 3 p.m. / 5 p.m. – 10 p.m.
MON – SAT 11 a.m. – 3 p.m. / 5 p.m. – 10 p.m.